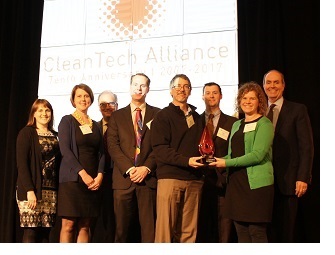 Nov. 16, 2017: The CleanTech Alliance, a Seattle-based consortium of more than 300 businesses and interest groups across six U.S. states and two Canadian provinces, honored UW with its CleanTech Achievement Award at the organization’s 10th anniversary celebration earlier this month. The group of regional business leaders recognized UW as an extraordinary resource for supporting the region’s cleantech talent pipeline, R&D base, infrastructure, and connectivity to the world. They also highlighted key programs that support this work including those of CEI, the Buerk Center’s Alaska Airlines Environmental Innovation Challenge, and CoMotion.